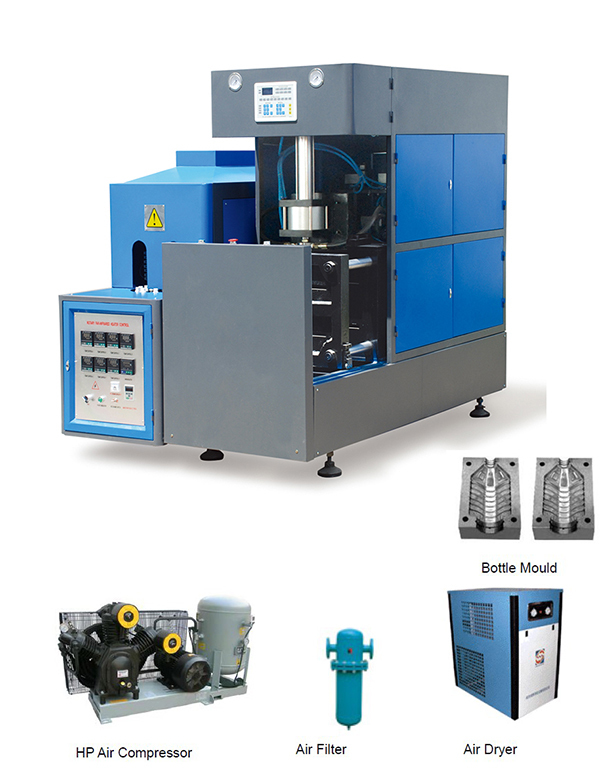 5-10L semiautomatic bottle blow molding machine is suitable for producing PET plastic containers and bottles from 5000-10000ml. It is widely used to produce the carbonated bottle, mineral water, pesticide bottle oil bottle cosmetics, wide-mouth bottle etc. 2. The air system has been divided into two parts: pneumatic action part and bottle blow part to meet the different requirements for the action and blow. It can provide sufficient and steady high pressure for blowing large irregular shaped bottles. 3. The machine is also equipped with muffler and oiling system to lubricate the mechanical part of the machine. 4. The machine can be operated in the step-by-step mode and the semi- auto mode. 5. The machine is small with low investment, easy and safe to operate by one person.